2014 - 33 people were killed and 130 more were injured when a group of men coordinated a terror attack using knives at a train station in southwest China’s Yunnan Province. 2015 - 50 workers at a Chinese coal mine were killed in a coordinated knife attack. Fifty more workers were injured. 2016 - a man killed 15 people and injured 45 in a facility for the disabled, then later surrendered himself to police. 2016 - a man in the southern province of Hainan stabbed 10 children before killing himself. 2017 - 13 people were seriously injured by a knife-wielding assailant at a shopping mall in Beijing. One woman died from her injuries. United Kingdom: The 250th fatal stabbing in the UK was recorded on the 7th November when a 16 years young male lost his life. On the 24th November, the day I started to further edit my article, a police officer has been stabbed in an "unprovoked attack" outside a train station in east London. The Office for National Statistics (ONS) said the 14,987 knife crimes in the year until the end of June was a 15 percent rise compared to the previous 12 months. According to different sources the total number of offences involving a knife or bladed instrument that have been recorded by cops in the year to March 2018 rose to 40,147, a seven-year-high. France: On the 13th May of this year, four people were injured and one was killed when a knife-wielding assailant shouting ’Allahu akbar’ attacked them in Paris. Another incident that made the news in France was when seven people were injured, by a man wielding a knife and an iron bar. In his 2010 book “Knife Crime: The Law of the Blade”, John McShane compiles a catalogue of the UK’s most high-profile knife murders over the last few years. Describing the 1995 murder of Philip Lawrence, McShane declares that it marked “the dawn of an age when the response to a confrontation was no longer verbal or even rough physicality. Instead it was the quick, uncaring thrust of a blade from a feral youth lacking compassion or morality, thinking only of himself and nothing of the havoc caused to those in his way or their loved ones.” Well, there is no question about it, we do live in a society where individuals care far less for each other than they used to, and one can also identify a lack of compassion in parts of today’s world. Every time somebody commits a murder or assault, by making bodily contact, by choking, beating or in these cases by stabbing others to death, it always speaks of a level of rage and sometimes even a personal connection to the victim, but it most certainly also reflects an incredible lack of compassion. Many of those individuals have ‘exploded’ and taken action ignited by additional anger, hate, disappointment or frustration. They were unable to control themselves or simply chose not to. This is not an argument about right or wrong. It is just about finding answers to ‘why does it happen? 1. Religious/Political Extremism – If you are so totally misguided and so extremely blinded, and truly believe that harming or killing others is the absolute only way you can reach happiness/fulfilment or reach your ultimate goal (whatever that might be)… then you are unlikely to stop from ‘proceeding’ with your action. 2. 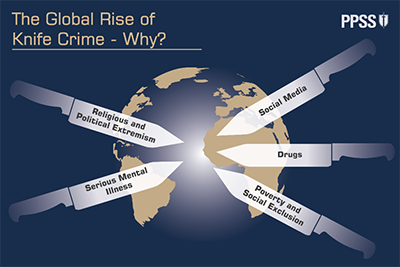 Drugs – the production of, the trafficking of, and the dealing with drugs has always and will always bring violence along. It simply comes as a ‘package’. One cannot produce, transport and deal with drugs without enforcing certain aspects during the process. Guns have been used a lot in the past and are still weapon of choice in some regions, but in more and more countries we can already and will continue to identify a shift moving to the use of edged weapon during above, and I will highlight in a second why that is. 3. Poverty & Social Exclusion – Knife crime and the carrying of knives are without any question symptoms of a broad social problem. Knife crime is mostly present in the poorest and most deprived places where violence is a clear sign of deeper problems such as poverty and social exclusion. That subsequent missing ‘sense of belonging’ often leads to the desire of wanting to become a member of a gang, which ultimately leads to the need of carrying and ultimately using a knife. 4. Social Media – yes, this has also been blamed for the increase in knife crime, with some experts arguing that social media means everything to these knife carrying criminals. 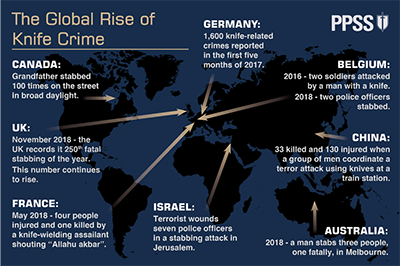 Some even say there might have been situations in the past where someone would have walked away and backed down, but now people are recording these attacks and videos of major knife attacks. These videos are being streamed millions of times, offering each and every one that ‘minutes of fame’ and more ‘followers’, and in their opinion that much craved for ‘respect’ and fear of them. 5. Serious Mental Illness – Many of those who have been responsible for multiple killings using edged weapons have been diagnosed with serious mental illnesses before or after the killings. I remember the particular case of Ashleigh Ewing very well. Ashleigh was a 22-year-old mental health worker, stabbed 39 times in a frenzied knife attack by a paranoid schizophrenic she visited in Newcastle. I have used this rather shocking example in several training events for ‘lone workers’, especially those working alone and entering the homes of others (health care, utility, housing, estate agencies and social services to name but a few). 1. RUN AWAY – if you can… run… run as fast as possible! 2. FILL THE SPACE – the good thing about a knife is you cannot get killed by such weapon from a certain distance. So, think very very carefully what you do to keep ‘that distance’. Anything you can do to prevent the attacker from closing this gap is a positive. It certainly will give you time, potentially enough time allowing others to assist you. Your ability of securing this gap will most likely have a fundamental impact on your chance of survival. Consider throwing things at the attacker (during a large scale attack in a city centre… scorching hot water from any café/bar/restaurant can be an extremely powerful weapon in that moment). The recent knife incident in Melbourne highlighted that even a shopping trolley can be used to ‘protect that gap’. 3. PROTECT YOUR VITAL ORGANS AND ARTERIES – stab resistant vests and slash resistant clothing would, without any question, be of great benefits, but the reality is you might not have that kit available when such incidents occurs, and you might have to deal with the situation as it is. 4. DO WHATEVER IT TAKES TO STOP THE ATTACKER – I will not go into the subject of ‘self-defence’ here, as I strongly believe to do so in just a couple of sentences would be extremely irresponsible. But, whatever you do, grabbing the person’s knife shouldn’t be your main objective and trying to disarm the person wouldn’t be my first choice neither. You have to pay attention to his current ‘ability’ to use that knife, and your single objective must be to turn this ‘ability’ into ‘inability’... whatever it takes!